Horse riding in the Orkhon Valley, a World Heritage Site in Central Mongolia. A real adventure: 3 days with pack yacks in Naiman Nuur Park, a very remote area. 3 nights in guest yurts with nomadic families to discover their unique way of life. This ride is also offered in "comfort" version, with all nights in yurts. Tour and visits as described, horseback rides as described, full board from dinner of day 1 to breakfast of day 13 except 1 dinner, English speaking translator, Russian 4x4 with driver, a cook per group over 4 persons, nomadic equestrian guide, financial guarantee of your deposits. Riding on horseback beside nomads through the wonderful landscape of the Orkhon Valley, is there a better way to experience the real Mongolia? This camping horse riding tour takes you to the most remote sites of the Valley, with the comfort of a support vehicle (except for 3 days with pack yaks in Naiman Nuur Park). Breakfast and drive to Karakorum, Mongolia'ancient capital. Picnic lunch en route. This is a long day on the road (6-7 hours drive - depending on the condition of the roads), but this evening, you will already be in the Orkhon Valley World Heritage Site, ready to start your horse riding tour tomorrow! After the visit, we set up camp in the wilderness at the entrance of the Orkhon Valley for dinner and overnight. After breakfast, meet the nomadic herders and horses who will be your companions during this horseback ride in Central Mongolia. We begin our equestrian adventure in the northern mountains of the famous Orkhon Valley. Picnic lunch brought by our support vehicules, nothing to carry on the horses, so we can enjoy many canters! After breakfast, we continue our horse ride in the Khangai Mountains. Picnic lunch brought by our support vehicules. After breakfast, we ride to Tovkhon Monastery, one of the major Buddhist sites in Mongolia. We reach the monastery with our horses at 2400m. We ride down the mountains to the Orkhon Valley. The views are astonishing ont the large valley with wooden mountains in the background. This regions is known as the cradle of the nomadic way of life in Mongolia. After breakfast, we ride to the famous Orkhon Falls. We continue our horse riding tour in the upstream part of the Valley where the landscape becomes wilder and wilder. This region has black ancient lava flows which contrast with the white running water of the Orkhon River and remind us Mongolia's volcanic past. We reach on horseback the larch forests with the impressive Naiman Nuur mountains in front of us. For the next 3 days, our horse ride will have a totally different pace: after the wide open spaces, we now ride in very wild and remote landscapes: the Naiman Nuur Natural Park, which means "the 8 Lakes Park". Pack yacks carry the equipment and your personal belongings for these three days as this beautiful and isolated area is not accessible to vehicles. We pack the luggage and camping equipment on the yacks and start our steep ride to the mountains. We will stay for 2 nights in guest yurts (up to 5 persons per yurt) with a nomadic family living in this very remote park. They are yack breeders. Today, we ride in beautiful forested mountains, discovering the wonderful scenic lakes of the Naiman Nuur Park, one of the most beautiful sites in Mongolia. Dinner and overnight at the guest yurts. Today, we leave the Naiman Nuur Park with our pack yaks, to go back to the Orkhon Valley. We ride through steep mountains, and will appreciate our sure footed horses and the ability of our yak drivers! We set up camp close to the yak breeder's yurt. Dinner and night under tents. We spend this last day in the Orkhon Valley with a nomadic family. The day is devoted to the discovery of the traditional lifestyle of the nomads of Mongolia. We can take part to the daily activities of the family. You'll find simple tips to facilitate contact with your host family here. During the day, we can still spend a few hours in the saddle, helping them to round up the herds, or just going for a ride to explore the region. Dinner and night in a "guest-yurt" close to our nomad family's yurts. Breakfast and transfer to Khogno Khan Park (4 hours drive - depending on the condition of the roads). Khogno Khan'landscape is very similar to Gobi Desert, in southern Mongolia. Visit of the Ovgon Khiid Monastery and short hike in the Elsentasarhaï sand dunes. For this last night in the steppe, we enjoy the magic of a touristic ger camp (yurt camp) in the desert. Dinner and night at the yurt camp (up to 5 riders per yurt, showers in a separate building). The rest of the afternoon is dedicated to shopping downtown, where you will find traditional clothing and objects of daily life. 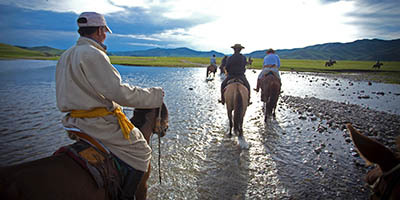 "A unique horseback adventure in the wonderful landscape of Orkhon Valley. You have time to discover the traditional nomadic way of life. 3 days are also spent in the very remote Naiman Nuur Park, with the fun of pack yacks." 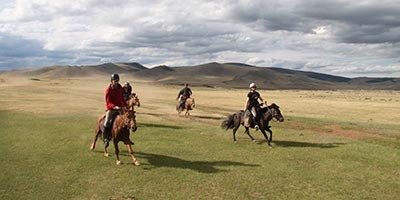 "A horse riding tour in Mongolia, it is the dream of every rider. This trip was amazing and full of good surprises. Very varied landscape, fairly intense rides, reliable horses! A 20 days horseback adventure: cross Mongolia from the Arkhangai steppes to Lake Khövsgöl. Explore wild and remote regions.